Hi lovelies! 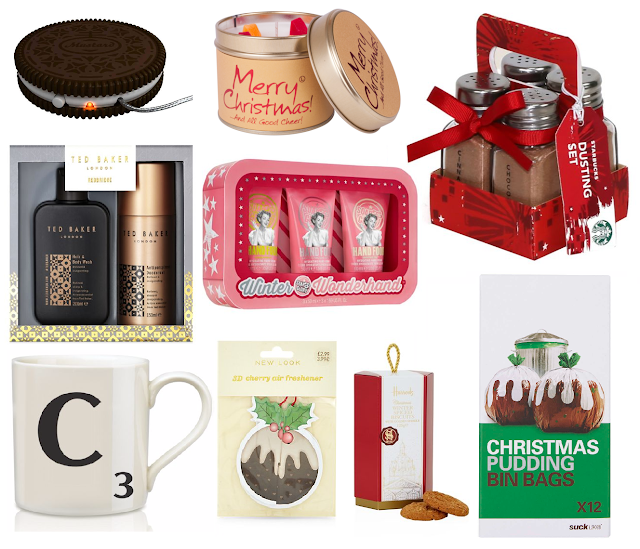 Today's gift guide is for those who have to buy a small gift for someone who they perhaps wouldn't always buy a gift for. Perhaps a Colleague in a Secret Santa, or a friend of a friend, a babysitter etc.. Just those people who you want to get a little something for, but perhaps you don't know them quite well enough to get something really personal. So, for those people I've put together an under £10 gift guide of crowd pleasing gifts! I think all of these are great for someone you don't know brilliantly well, because they're all very nice gifts without being overly personal. For a slightly more personal touch, I think the scrabble mug is great, because you can get the persons Initial, making it a technically personalised gift without having to overthink it! I think the bodycare sets and candle are pretty fail-safe gifts as everyone needs to wash/ look after themselves and it's always good for your house to smell like Christmas in December! I absolutely love the Christmas Pudding bin bags because I think these would be fab for men or women and make the excessive amount of rubbish you tend to have at Christmas actually look kind of cool! Lots of people get biscuits, chocolate and other food gifts in Secret Santas, but I think the set from Harrods just makes it a little more special. Hope this helped! Do you have to buy a secret santa gift this year?